Redmond, WA - Before Ralf Groene helped devise the look and feel of Microsoft’s Surface tablet, he designed food — or “food concepts,” he says, for people on the go. Among them: dried noodles that come wrapped around a pair of chopsticks; a tubular meal that can be pulled with two fingers from a car cup holder base; and a fork that squeezes out sauce. Though none of these ideas made it into production, the principles behind them can be applied to computing devices that fit into busy lives, says Groene, and they are just as varied as the ones Microsoft now uses to redesign all its software and devices. Groene and his team designed the Surface to accompany its users everywhere. It can be used as a tablet-style news reader propped up on its kickstand while you eat your morning bowl of cereal, as a notepad to be scribbled on with a digital pen at a business meeting, and for watching a movie while sitting on your couch later in the day. Microsoft is putting an emphasis on design excellence more than ever — to make its products more competitive with offerings from rivals Apple, Google, and Amazon and to prod its hardware making partners to dream up new, more innovative devices. In recent years, the software giant has put a priority on fashioning devices that work around people’s lives, help reduce information overload and become intimate, personal and knowledgeable about their users. And yes, Microsoft is even trying to make devices attractive, cool and desirable, top executives say. Over the last four years, Microsoft has doubled the number of designers it employs to some 1,400. They have backgrounds as varied as filmmaking, food and footwear. While that pales in comparison to the 64,000 engineers who make up over half the company’s workforce, designers are now shaping products, building user interfaces and mocking up devices with wood and 3-D printers. Even as the company eliminates 18,000 jobs — most of them related to its purchase of Nokia’s devices unit — Microsoft is empowering people like Belfiore and Groene to challenge conventional notions of what Windows devices can do. Microsoft’s new design ethos is a break from the past — a time, not long ago, when the company’s software was largely a workplace necessity housed in functional plastic that was crafted by other companies. It’s no secret that Apple is the world’s most beloved technology company in part because its devices are sleek, comfortable, and easy to use. And Microsoft now wants to infuse its products with the same qualities. Designers today are woven into the process, from the early stages of product development to the way products are marketed to consumers, Belfiore says. Microsoft has also recently elevated designers to more prominent leadership roles. Take Albert Shum. A former designer for Nike, Shum was part of the team that revolutionized the Windows Phone software design to feature the boxy, “live tiles” that are central to the Windows 8 touch-based interface. Shum now heads “interaction design” for PC operating systems, Xbox game consoles, and phones, all of which were previously managed separately. Microsoft’s modern design philosophy draws upon the minimalist Bauhaus movement, which stresses function over ornamentation, while adding in clean typography and swooping motions. This common design language is key to making Microsoft’s offerings seem like a related family of products and services. With minimal market share in both tablets and phones, Microsoft has its work cut out for it. Yet a focus on design over compatibility under new CEO Satya Nadella means Microsoft can make products and services for non-Windows platforms, such as Apple’s iOS and Google’s Android, and still retain the look, feel and functionality of the Microsoft brand. Steve Kaneko, a design manager who has been with Microsoft since 1991 and has worked on Office, Windows and other projects, said it’s important for the company to not only design its products to work well on other platforms, but to talk about what design means to Microsoft. That’s become an easier conversation to have with top executives including Nadella, who took over as chief executive in February. It’s a dialogue the company wants to start with consumers, Kaneko says. As part of one noteworthy design project, the company plans to make greater use of the tiles in an update to the Windows 8.1 operating system. Pressing Start while in desktop mode will soon bring up several boxy live tiles in the pop-up menu, from which users can launch touch-first apps in the traditional mouse-and-keyboard environment — a feature it previewed at its Build developer conference in April. 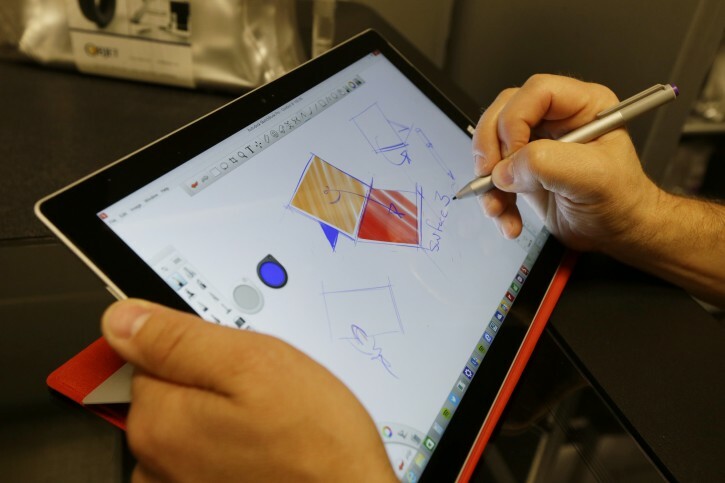 Groene’s Surface team already showed off design improvements with the Surface Pro 3, released in June. Clicking the device’s accompanying pen launches the OneNote note-taking app, so it’s as ready as a yellow legal pad for scribbling. And a new bar magnet on the keyboard cover and a kickstand with a wider range of motion helped created a sturdier foundation for typing on a lap. Another problem the design team is working on: fixing the “hamburger” icon, says Shum. The icon, featured in Windows Phone and the Xbox One, has three stacked lines resembling two buns and a patty. It mostly acts as a “junk drawer” for random menu items, so it’s not clear what you’ll get when you click on it, Shum says. On the Xbox One controller for instance, a physical hamburger button represents “enter” on a virtual keyboard. In games like “Titanfall,” it brings up a menu of various in-game options. In Windows Phone’s Cortana app, though, a hamburger button will bring up options for interacting with the digital assistant. Shum says his team wants to make the icon work similarly across devices. A hint: it will act like a signpost in a city with many neighborhoods. “It should always be this thing that allows you to go to different parts of the city,” he says. The company is also working to expand the use of the Cortana digital assistant, which is active on some Windows Phone devices. The voice-activated persona is meant to offer help proactively — giving you a snapshot of traffic on the route from the office to your home when the workday ends, for instance. Kat Holmes, a principal designer who helped design Cortana, is working on ways that it might work in other Microsoft devices, from PCs to the Xbox. The guiding principle, which adheres closely to Microsoft’s new philosophy, is to help the user in various ways depending on the situation.